The writing formalities may credit the real name of Ron Fortugno but as soon as you immerse yourself into the mind of this creative Canadian artist, you are well and truly hooked into the world of Petunia and the Vipers and taken on wonderful journey through the musical heartland of rural life either side of the 49th parallel. This latest self titled release from the wanderlust performer, currently based in Vancouver, is a pure soundtrack to the Trans Canadian Highway taking in a little bit of country, western swing, rockabilly and adding a touch of ragtime and even a hint of Latino – in essence a truly eclectic and evocative album. Right from the outset, the acquired sound of yodelling accompanying the opening track ‘The Cricket Song’ paints a vivid picture of an old time grainy cowboy image and the sound reminiscent of the 30’s classic ‘Cattle Call’ and its numerous interpretations. The theme of old time Country and Western returns later on the record when Petunia delivers a version of the Irene Stanton/Wayne Walker penned ‘Forbidden Lovers’ that is almost comparable to those of Hank Snow and Lefty Frizzell. Even though you could quite happily sit back and listen to Petunia deliver an album’s worth of traditional country, he has not spent a lifetime being a drifting troubadour not to absorb a wide range of influences and this record is the perfect vehicle to share those with the listener. The 6 minute long ‘Stardust’ followed by the 7 minute ‘(Never, Never Again) The Ballad of Handsome Ned’ can test the stamina of the casual listener and the occasional surreal vocals may need a little adjusting to but the ultimate reward derived from one’s endeavours make it a very worthwhile investment. 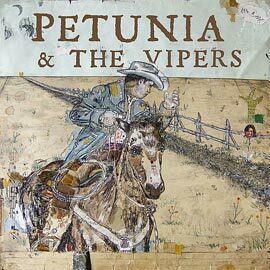 So if American roots music is your passion or you just want to listen to a rewarding well constructed album, enter the world of Petunia and the Vipers and let them transport you on a musical odyssey.